Osaka - Bangkok - Yangon (Myanmar). (1) Participated in a workshop at the Myanmar Field Station in Yangon. (2) Yangon - Bagan. Conducted acoustic ecology research in villages near the Bagan Buddhist ruins. Bagan - Mandalay. Conducted acoustic ecology research at villages on the way from Bagan to Mandalay. 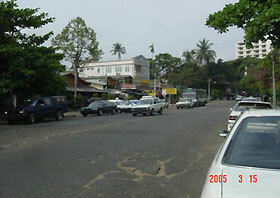 (1) Mandalay, Yangon, - Maubin. Field trip to Maubin village. I conducted a workshop at the Myanmar Field Station. I recorded environmental sounds in Bagan and Maubin. Although Myanmar is not yet heavily motorized, there is significance to capturing the current situations through audio and visual records in anticipation of changes in the near future. Traffic in Yangon: Yangon city has this much traffic. Unexpectedly there are few motorcycles. 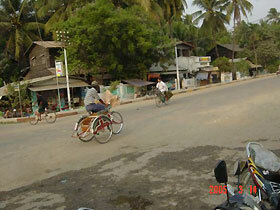 Traffic in Maubin: People in Maubin mainly use bicycles for transportation. There is very little car traffic.